1/2 frozen banana (peeled and sliced before freezing) I keep them in a Ziploc bag in the freezer. 1/3-1/2 cup coconut milk. (The less milk, the thicker the pudding). Place avocado, banana, cocoa powder, stevia powder, and milk into blender and mix. 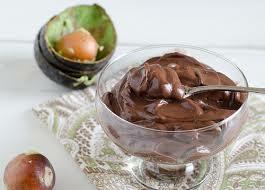 Now you have a yummy delicious chocolate avocado pudding. Tip: You can add protein powder or other powdered and liquid supplements to the chocolate avocado pudding and it will mask the taste. I was surprised when I tried it. Hadn’t ever thought about combining those two ingredients!